Reports last night indicated that soldiers fighting insurgency in Borno State protested against their posting and disrupted operations at the Maiduguri International Airport. The protest started when pilgrims meant for this year's hajj in Saudi Arabia were boarding their flight. As part of the protest, the soldiers shot indiscriminately, forcing airport workers to scamper for safety. But there was no indication that anyone was harmed in the melee, as the pilgrims boarded their flight, which took off, but no other flights were allowed at the airport. According to reports, the soldiers were protesting their deployment from the state capital to another local government area. 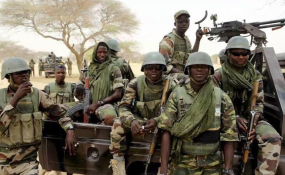 The aggrieved soldiers were said to have reportedly arrived at the airport at 6 p.m yesterday ahead of their posting to Marte Local Government Area. The soldiers refused to board the aircraft, which ought to convey them to Marte local government. In their protest, they argued that after spending over four years in Maiduguri, they ought to be sent back to their families and not to be posted to face death. The soldiers directed that their Commanding Officer should stay away from the airport or they would shoot him. About two year ago Arik Air and Medview Airline started operating scheduled service to the capital of Borno State after a long interlude of non-commercial flight service to the city due to the insurgency.